It has been some time since I last ate vegetarian food. 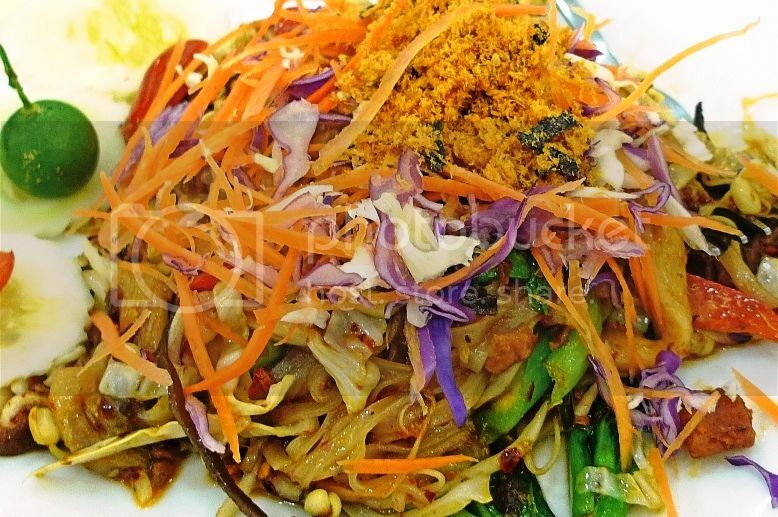 I am actually not very fond of vegetarian food but the two vegetarian restaurants that I do not mind going to are Organic Recipe and Kuan Yin Vegetarian Restaurant. 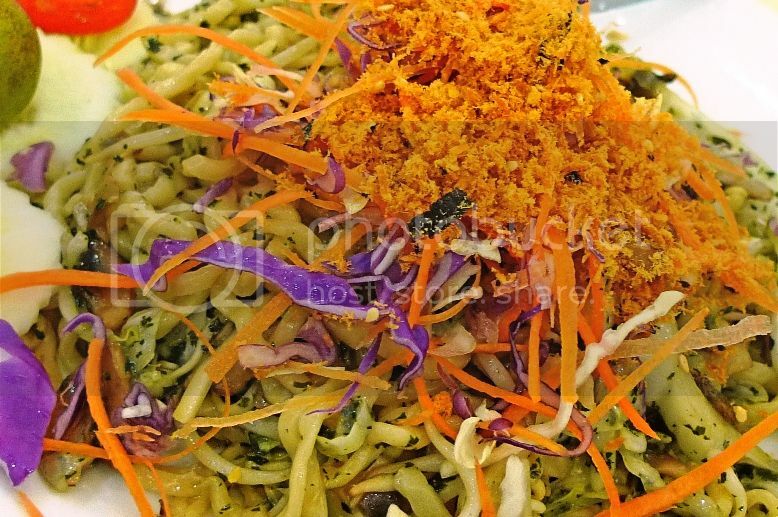 The difference between the two restaurants is that Organic Recipe serves organic vegetarian food whereas Kuan Yin Restaurant serves non-organic vegetarian food. 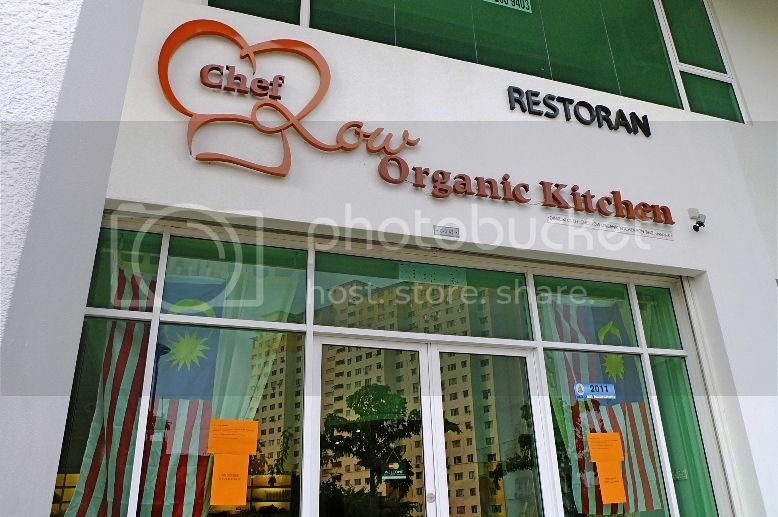 Last Sunday, I had another opportunity to dine in an organic vegetarian restaurant called Chef Low Organic Kitchen. Located at 10 Boulevard in Kayu Ara along the Sprint Highway in Petaling Jaya, this restaurant cannot be seen from the Sprint Highway as it is actually on the other side of the building that is not facing the highway. 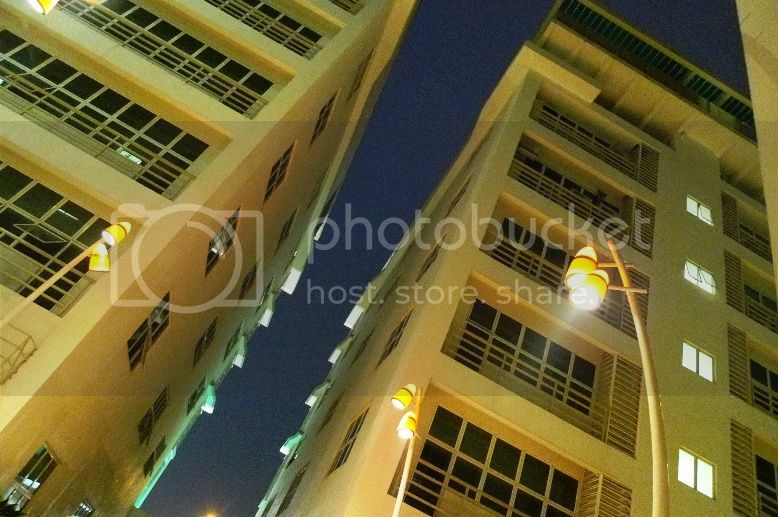 Does the building above look familiar to you? 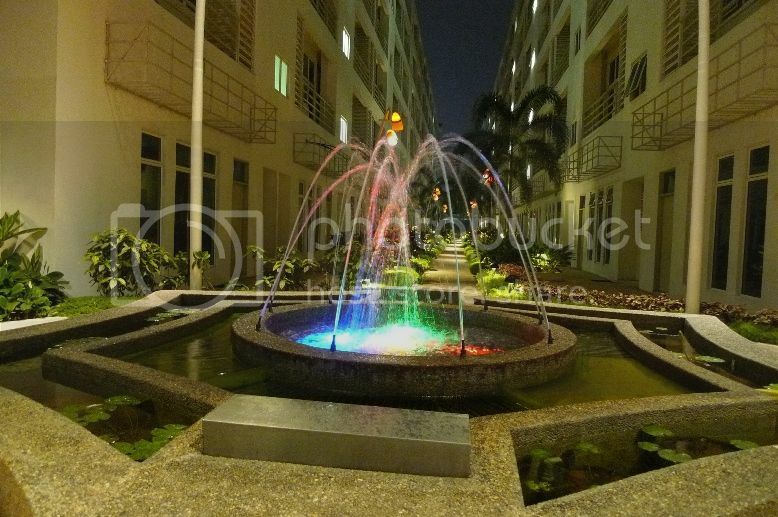 It is the 10 Boulevard commercial complex. It was my first time entering this building although I passed by it many times. To get to Chef Low Organic Kitchen, you need to drive to the other side of the building that is not facing the Sprint Highway. My family and I had went there for dinner. As I entered the restaurant, I noticed the place was bright, elegant and clean. 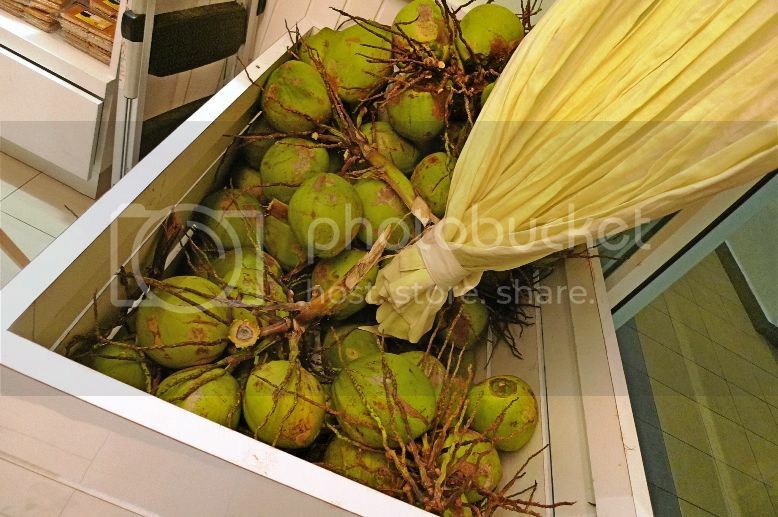 There were fresh coconuts in a corner near the entrance. We got ourselves a nice table that fitted the five of us. Opening the menu I was greeted with this message on the first page. OK, it was definitely my first time seeing this quote coming from Albert Einstein. 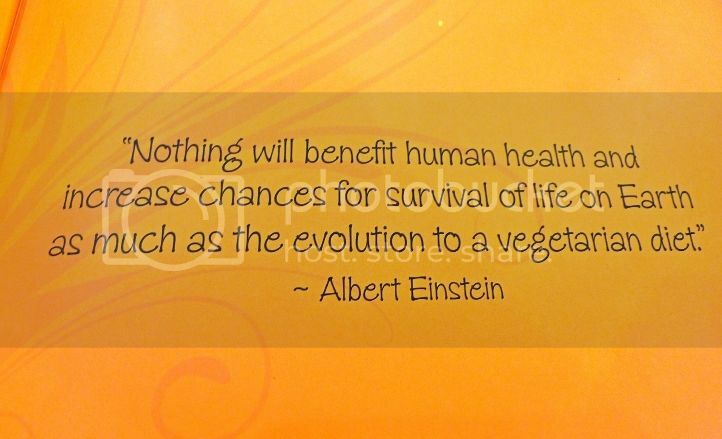 Was Einstein himself a vegetarian, I wonder? We first ordered their signature fruits tea. 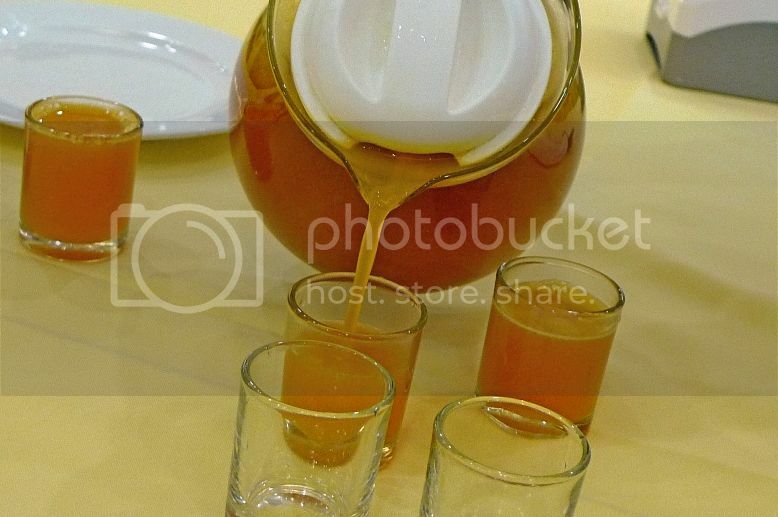 The tea came in a large jug which we poured out into five glasses. There were two sizes - Large, priced at RM15.90 and Small, at RM12.90. We chose Large. 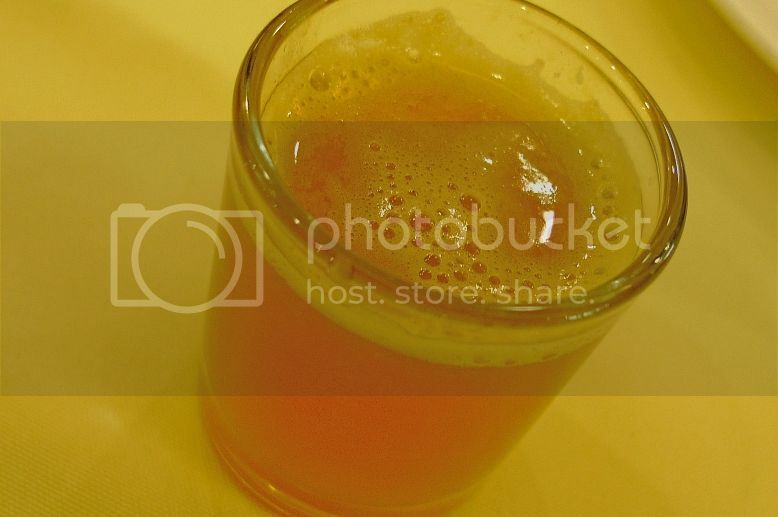 My glass of fruit tea. I had a sip and it tasted warm, nice and slightly sweet. The drink was addictive. I finished one glass in no time and refilled it from the jug. I just wanted to keep on drinking and drinking but I had to restrain myself or there would be none left for other members of my family! 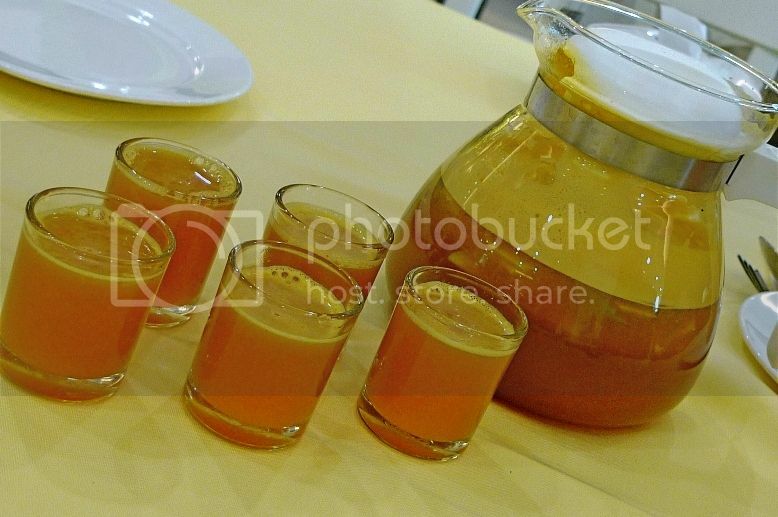 I was curious to know what fruits were used to make the fruits tea so after we finished drinking the whole jug, I took a picture of the fruits inside the jug. If not mistaken, I think they were slices of apples, pears and oranges. Well, guess what? My mom ate up all the fruit slices and why not? These extra fibres are definitely good for health! Since this is a vegetarian restaurant, I was pleasantly surprised to see from the menu that they offer Western, Chinese, Japanese and Thai food! First, we ordered the Thai fruit salad. Priced at RM6.90, this salad was pretty good although I was not sure if it could be called Thai fruit salad. 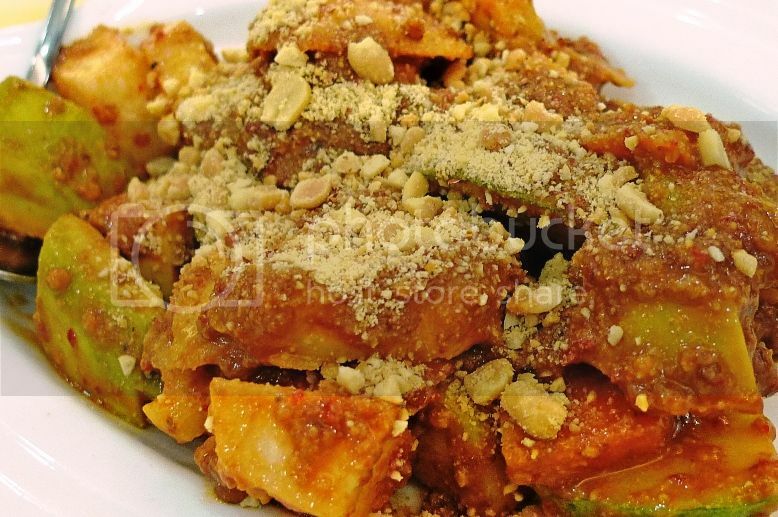 Chunks of mango, papaya and possibly other fruits in yummy sauce topped up with sprinkling of peanuts - definitely a good appetizer if any! Next we had herbs fried ramen which did not look that good but taste wonderful! Priced at a reasonable RM10.90, this big plate of ramen was delightful to eat! 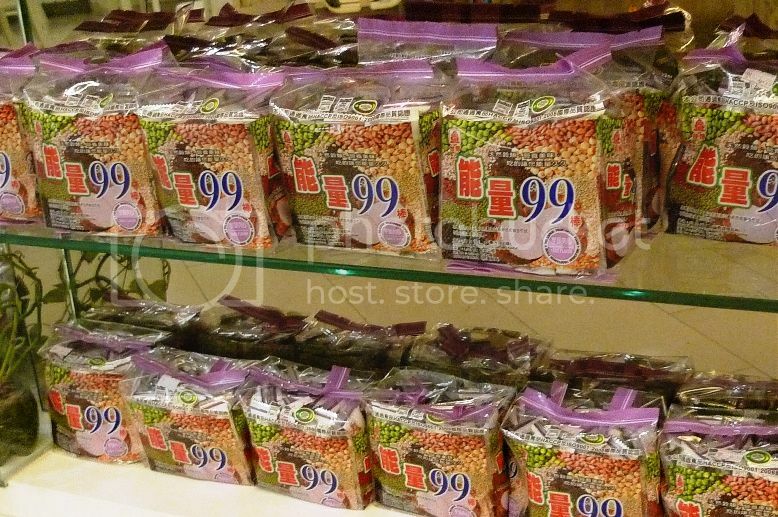 After that, we had pine nuts lotus root priced at RM13.90. 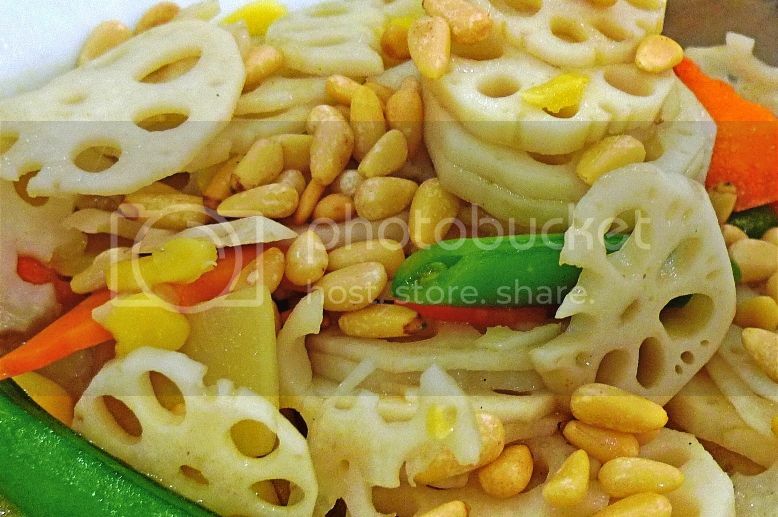 I don't know about you but I always love to eat lotus root, and this dish which combined lotus roots and other vegetables was yummylicious! 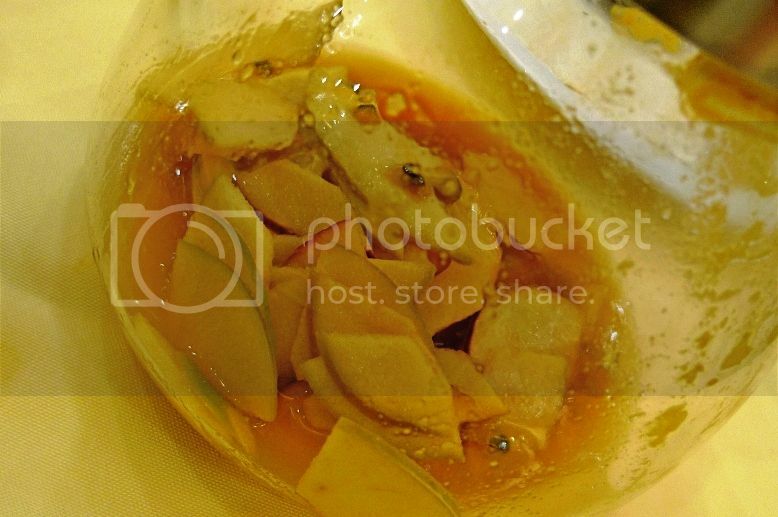 Next, we had Chinese mahogany beancurd. Another mouth watering dish, the beancurd was delicious but I only managed to eat one! Well, there were only about five or six slices of beancurd on the plate and I could not be too greedy, could I? This dish was priced at RM12.90. 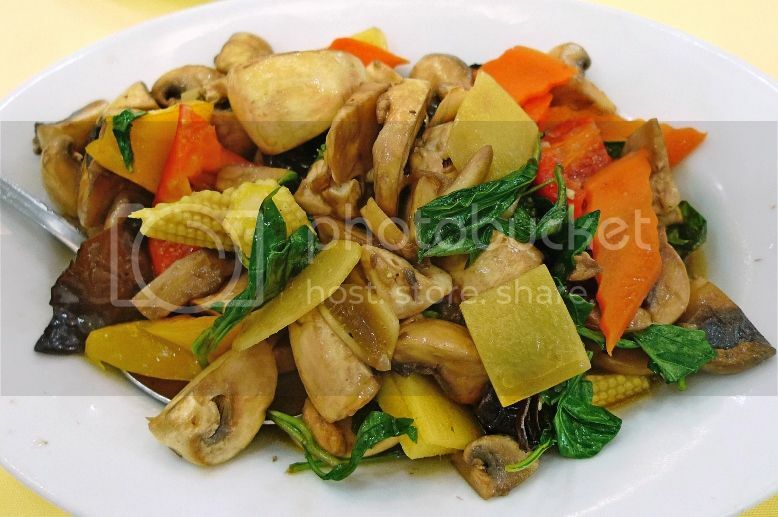 If you like mushrooms, then this basil leaf mushroom may just be your cup of tea! It was not my favourite dish but I had no complaints really. At RM13.90, I considered it quite reasonably priced. Now let me tell you about the fantastic fruit pizza! I can tell you this is one of the best pizzas I have ever eaten! 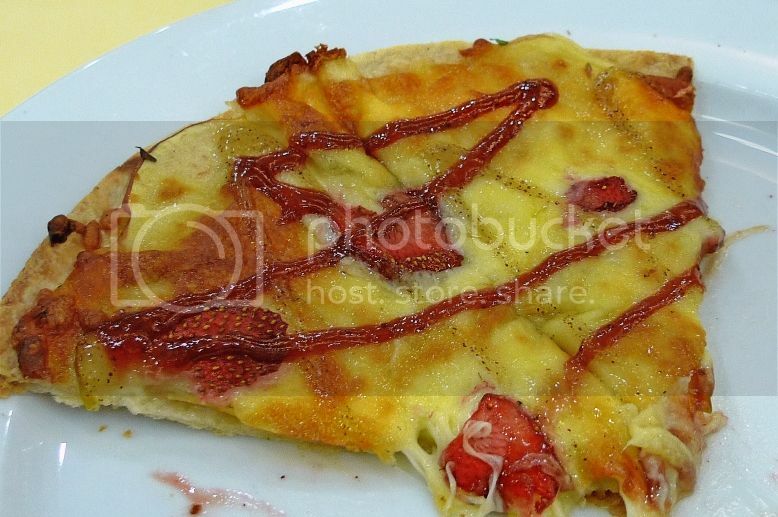 Thin, crispy and with the aroma of fruits and cheese, this is a MUST-EAT when you dine in this restaurant! I had almost wanted to order this pizza again after finishing it, but I knew I had to stop myself from doing so. Priced at RM19.90, it was awesomely delicious! 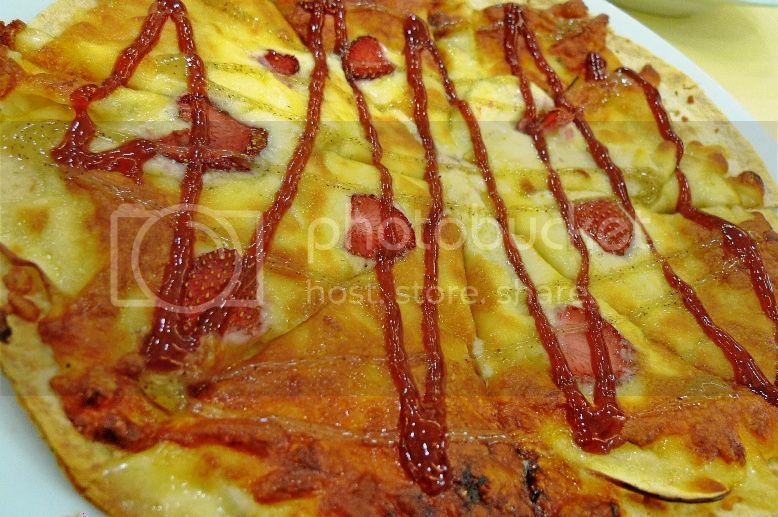 I would definitely eat this pizza again the next time I visit this restaurant! Our next dish, the Pad Thai Spicy was a disappointment. 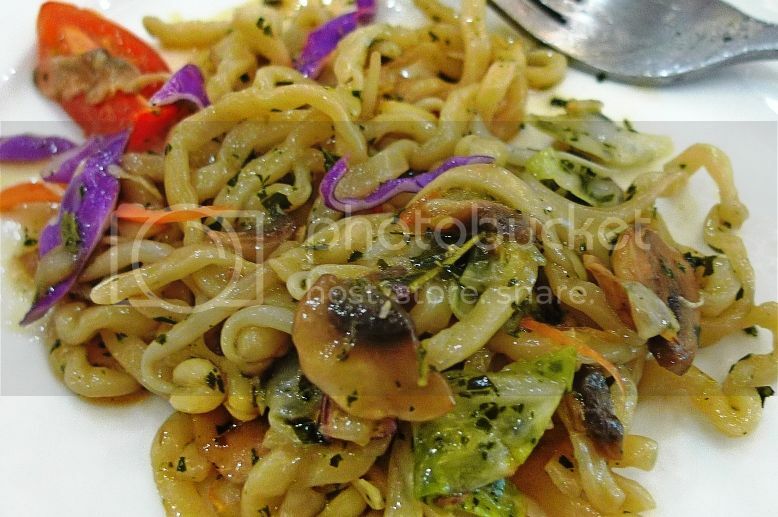 This stir-fried rice noodles was too oily and was not tasty enough for my liking. It was however, quite reasonable priced at RM12.90, although I could have used that money to order say, another plate of herb fried ramen! Oh well, you never know unless you try right? After all these food, we still had a little bit of space left in our stomachs so we ordered one more dish. 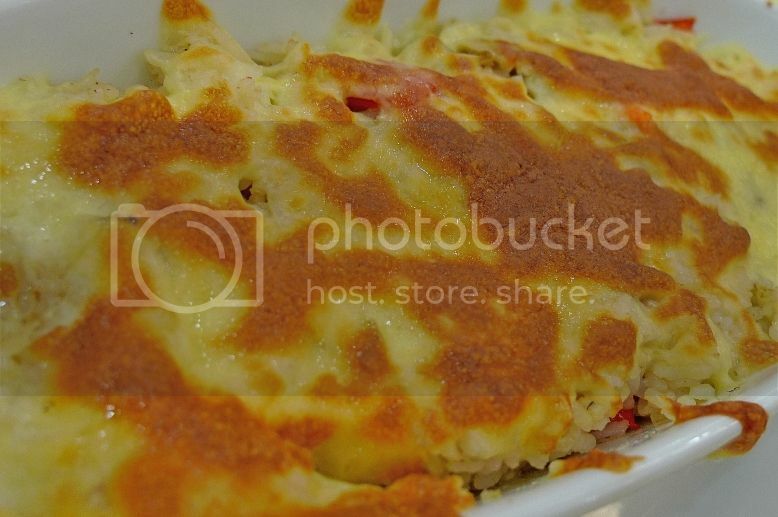 Guess what dish is this? 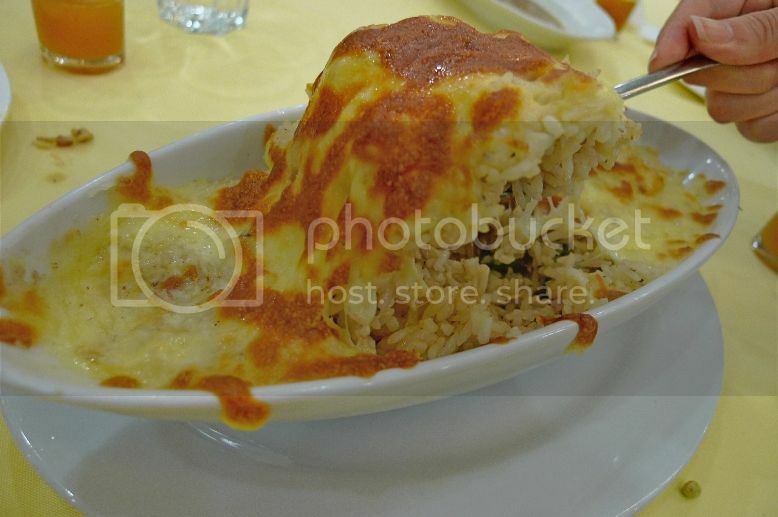 It is the mushroom baked rice with a layer of cheese at the top! 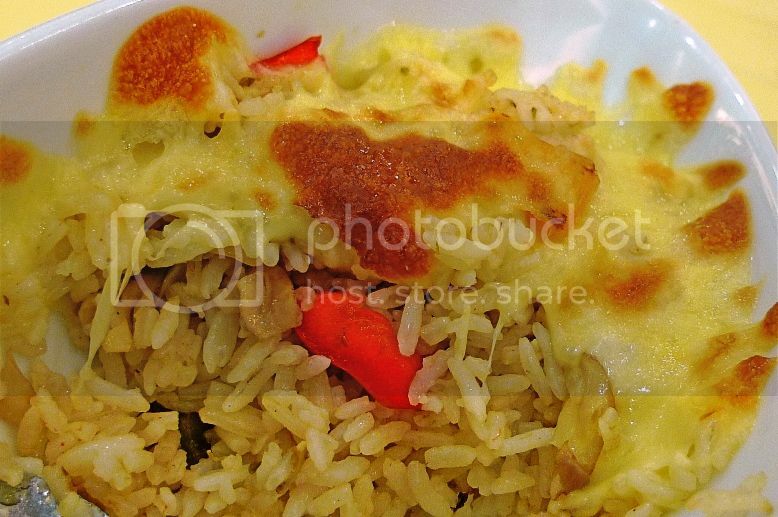 Some people may not like the cheese on top of the rice, but for me, it is the cheese that makes it special! 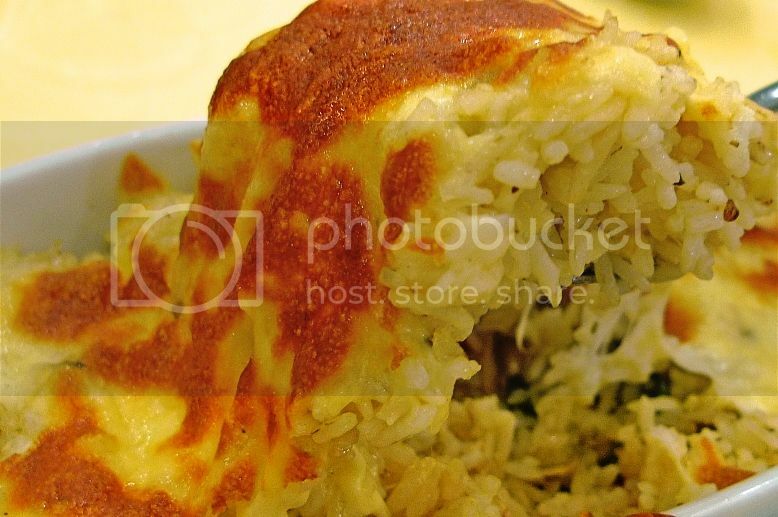 At RM12.90, this mushroom baked rice was delicious! It really filled me up pretty good! Chef Low Organic Kitchen also serves desserts like mango pudding, mud pie, cheese cake and home made ice cream, but that day, I was in the mood for their coconut pudding. 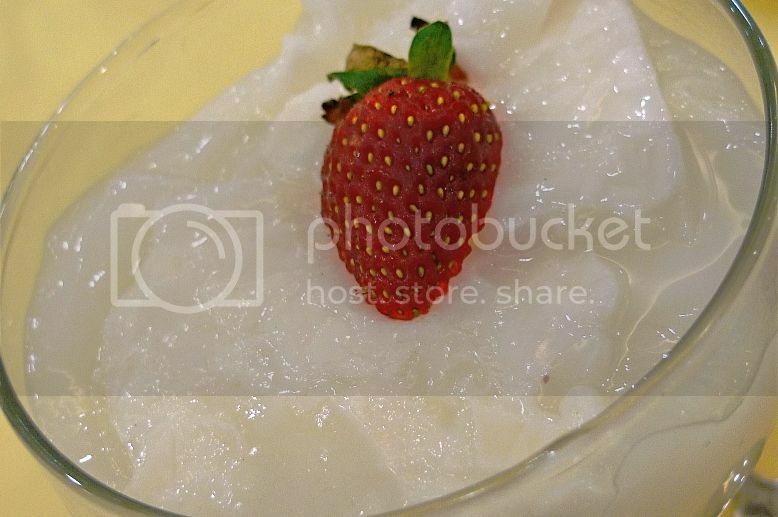 Priced at RM4.90, this delightful pudding contained coconut flesh buried inside the jelly pudding. It was not too sweet and had a very lovely coconut taste and aroma. The only problem was, it did not come chilled. And that spoilt the whole dessert which was a pity! Our total bill came to RM131.80 (which includes a 5% service charge) which I though was pretty reasonable for an organic vegetarian restaurant! 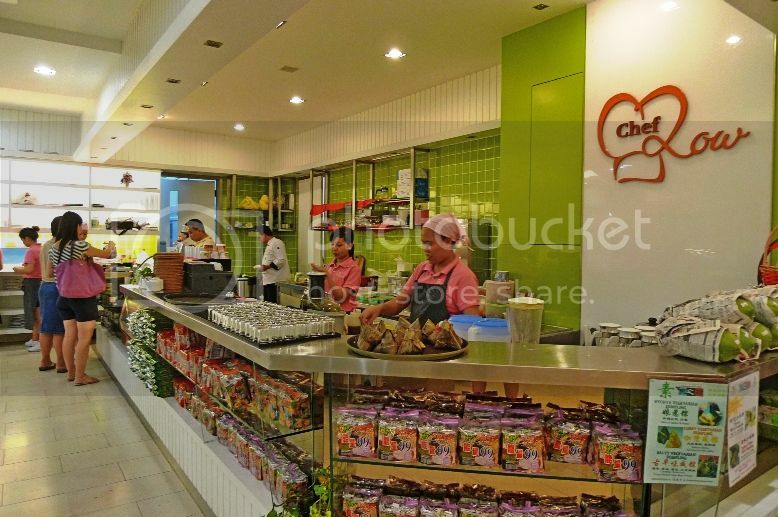 If you think that eating organic and eating vegetarian food are expensive and not tasty, well, I dare say that this Chef Low Organic Kitchen will change your mind! 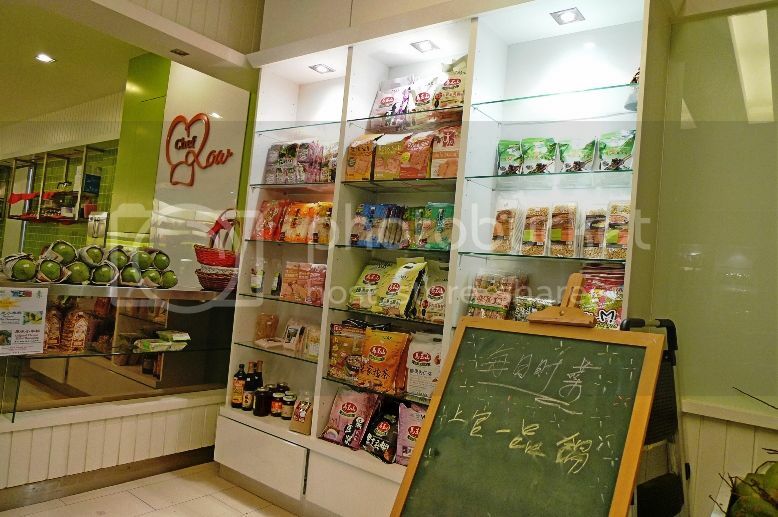 Besides serving delicious organic food, this restaurant also sells organic snacks like cookies, nuts, jams and condiments. 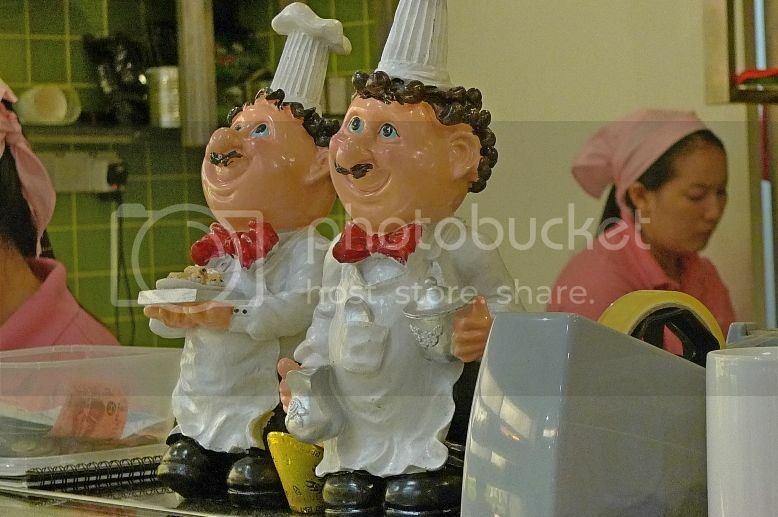 Chef Low Organic Kitchen does not use eggs, garlic, onions and MSG in their food preparation. And since most of the materials are sourced from organic farms, you can be assured of a healthy meal that is suitable for people from all walks of life and religions! They say it's good to do some walking after dinner to help with the digestion, so my family and I went for some leisure stroll around the block. 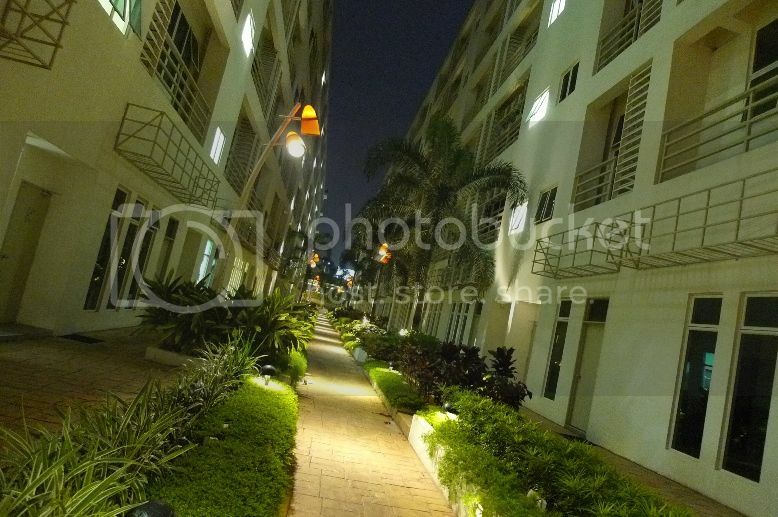 I would have to say that this 10 Boulevard commercial complex was rather quiet. It was quite surprising that many people knew about this Chef Low Organic Kitchen located in this building. In fact, during our dinner that day, the restaurant was filled almost to the brim! The restaurant must be really successful as I found that it actually occupied two shoplots! 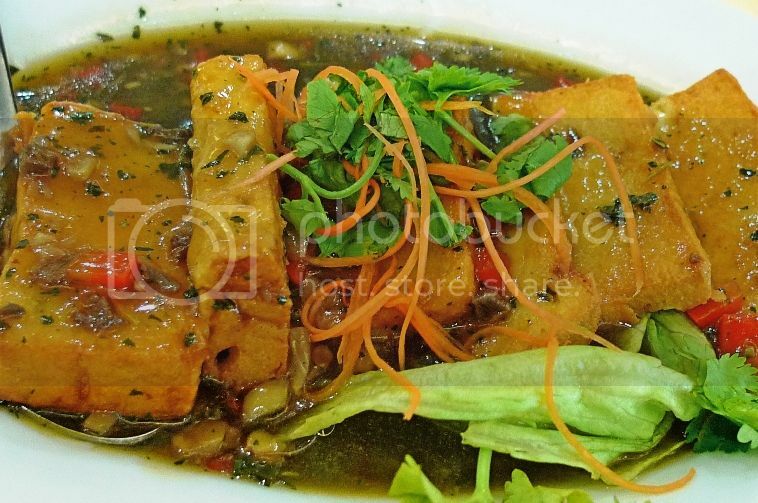 I really do not mind going for another round of healthy, organic vegetarian dishes! 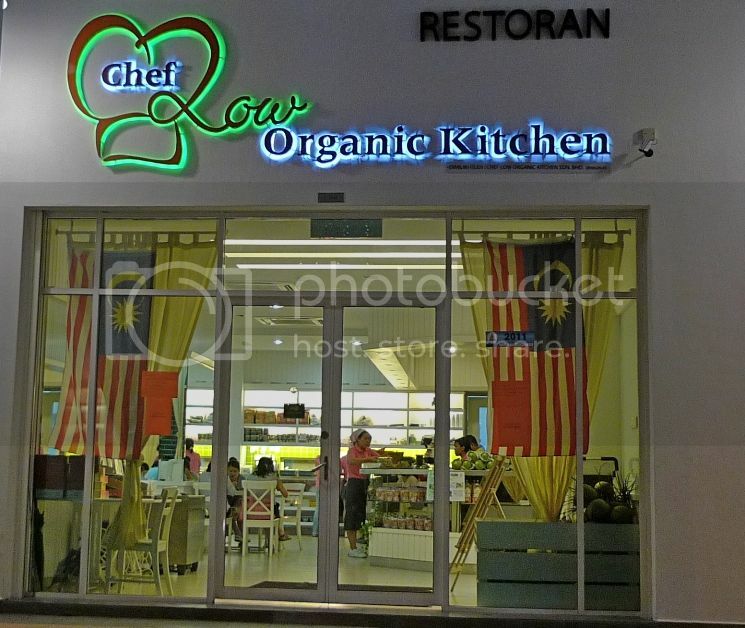 Anyone want to join me for dinner at Chef Low Organic Kitchen? 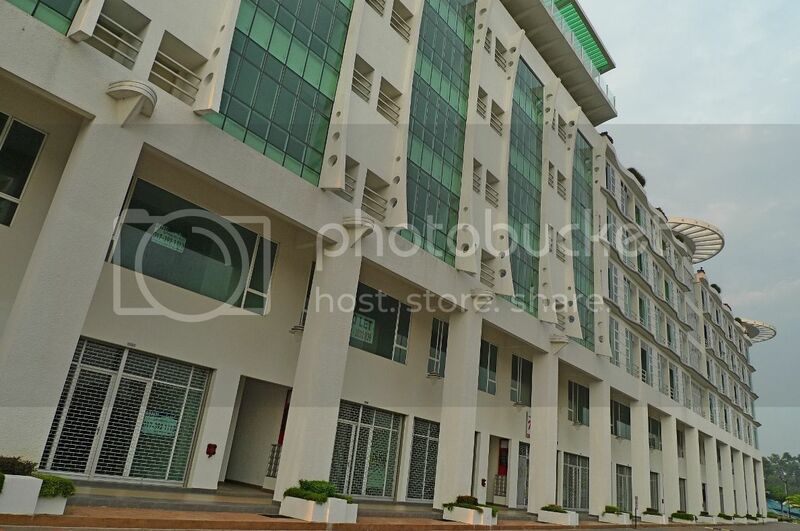 PJU 6A, 47400 Petaling Jaya, Selangor.